Oct. 26-Nov. 1 is National Bat Week, which serves to raise awareness on the value of bats and the conservation challenges they face. 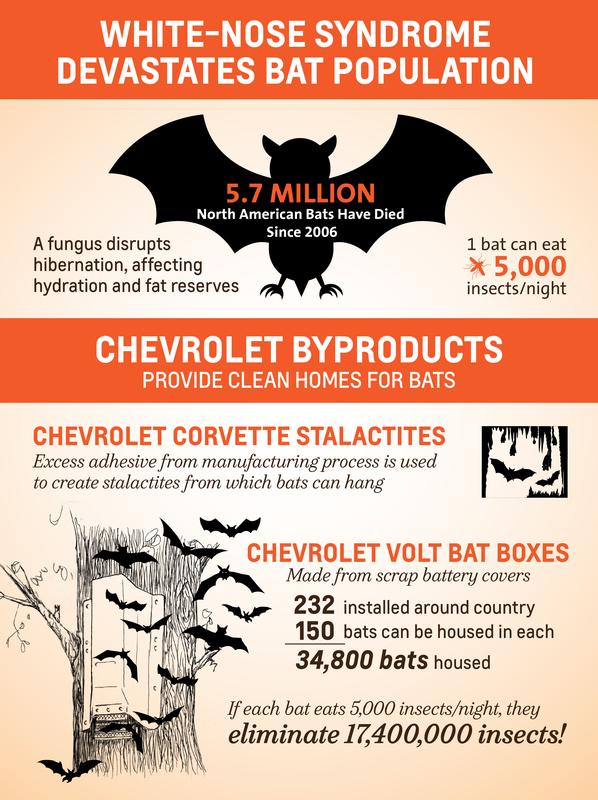 GM creates bat houses out of scrap Chevrolet Volt battery covers that can hold up to 150 little brown bats each. John Bradburn, GM global manager of waste reduction, came up with the reuse idea, transforming the difficult-to-recycle material into nesting structures. 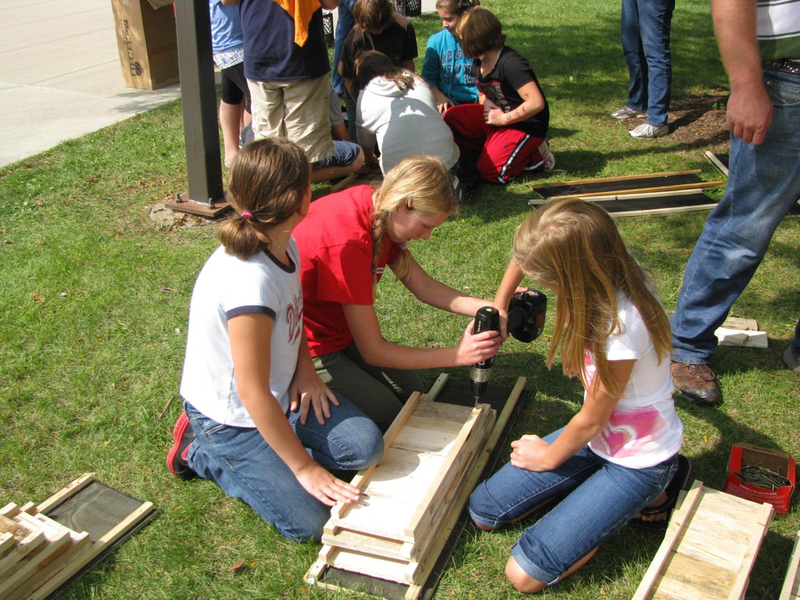 GM often works with local youth through schools, clubs and recreation centers to put the finishing touches on the bat houses. It has 232 of these structures installed at its properties and other private and public lands in the United States. DETROIT, October 29, 2014 /3BL Media/ – An adhesive used in production of the 2015 Chevrolet Corvette Stingray may help preserve a threatened bat species in North America. General Motors found that when processed, the adhesive can serve as a stalactite in artificial bat caves. International bat experts from such non-governmental organizations as Bat Conservation International and the Organization for Bat Conservation are reviewing the application. White-nose syndrome, a deadly fungus appearing on the muzzle and other parts of hibernating bats, has killed more than 5.7 million bats to date in the United States and Canada. Bats with the disease act abnormally and wake from hibernation too frequently, leading to death. There is no cure for white-nose syndrome, but remedies like nontoxic fungicides and artificial bat caves show promise. Saving bats is important because they contribute to the overall health of the environment. A single bat eats up to 5,000 insects a night, which means farmers can use fewer pesticides. They are also pollinators that help repopulate plants and maintain forests. Artificial stalactites give hibernating bats more surface area from which to hang, thus spreading them out around the cave. Creation of the stalactite is simple; robots that apply a structural adhesive that helps join Corvette body parts are purged regularly to keep the adhesive applicator clean and free of dried material. This dried gunk is the perfect shape for a stalactite, and its use in artificial bat caves avoids sending it to landfills. Bat projects have been a part of GM for several years, examples of GM’s industry-leading 26 certifiedwildlife habitat programs and penchant for creative recycling. The company also creates bat houses out of scrap Chevrolet Volt battery covers that can hold up to 150 little brown bats each. John Bradburn, GM global manager of waste reduction, came up with the reuse idea, transforming the difficult-to-recycle material into nesting structures. So far, 232 of these bat houses have been installed on its properties and in other private and public lands in the United States. A tweak of the design has led to 368 specially designed structures to serve wood ducks, owls, bluebirds and scaly-sided mergansers – an endangered species. GM often works with local youth through schools, clubs and recreation centers to put the finishing touches on the nesting boxes. “It’s important to get kids involved in these projects, helping them to see things not as they are, but what they can be,” said Bradburn. GM Brownstown Battery Assembly, which generates scrap as it assembles battery packs for the Volt, is one of GM’s 122 landfill-free facilities. For more bat facts and information, visit Save the Bats and National Bat Week on Facebook or read more at www.batcon.org and www.savebats.org/bat-week. For more information on GM’s environmental commitment, visit its sustainability report andenvironmental blog.